So I’ve been using a Chromebook now for a few weeks and I thought I’d say a few words on it. I’ve seen it slated in various places because of what it is (basically a dumb terminal with access to the web). However, whilst that’s pretty apt, I thought I’d mention my thoughts on it. 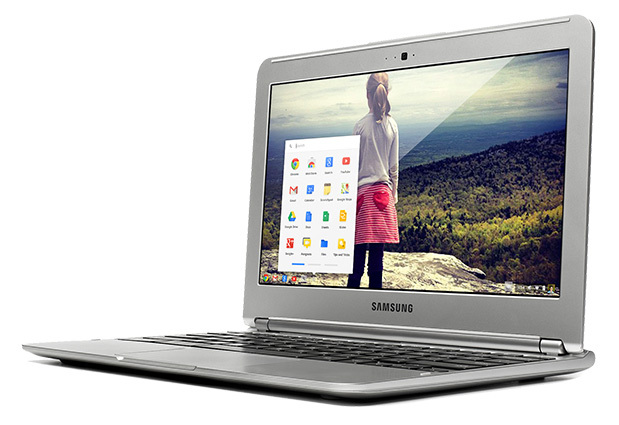 I purchased the Samsung Series 3 Chromebook, partly due to it’s similarities to the Macbook Air. Yes, I’d probably prefer a Macbook Air but the cost is to high to justify on a laptop that I wouldn’t use much. The Chromebooks pricing was far more attractive. So yes, the Macbook style Chromebook beat the contenders from Acer for various reasons - size and battery life being big decider’s, even if the Acer one is an x86 based CPU machine and this Samsung one is an ARM chip (as it turns out, that makes no difference). Weight wise and size wise, it’s a fantastic laptop to carry around. It fits my Pantagonia Mini Mass bag perfectly fine (without a case or cover) and that’s also with my iPad and Kindle in. I can suddenly see why people were raving about the Macbook Air. In the run up to getting one, I forced myself to become more familiar with the Google ecosystem again (I left Mail and Calendar for iCloud when iCloud was released). I also forced myself to use Chrome over the more commonly used Firefox on my work and home machines. This move back to the Google Services eased my transition to the Chromebook. The biggest move was from Dropbox to Google Drive - a few snagging issues there that I’ll talk about perhaps in another post but for now, the main points I found there was the slight difference in how Google Drive overwrites files you upload on the website (i.e. it doesn’t overwrite them!) - not something that applies to much to the Chromebook it appears. However, when I got the Chromebook, I eagerly opened the box and got ready to get started. So getting started with the Chromebook was simple - charge up the device (a bit a shame in comparison to Apple’s “buy, open and go” policy). However, once charged, you’re greeted with signing on to a wifi network (you’ll need wifi, the Samsung model has no ethernet connection). Once done, it asks for your Google account details (and supports 2 factor authentication for those that have it enabled) and it then checks for software updates. 15 minutes later and I was logged in and ready to go. I should point out that typical bootup time is as Samsung and Google suggest - 7 seconds or so give or take. And that’s it - no downloading of programs or anything. Sign in and you’re ready to go. Simple. My main concern was that of offline access. The Chromebook is designed to use web services and that means that without the web, the benefits of the Chromebook aren’t perhaps as apparent. It’s partly the reason I enabled the Developer mode on my Chromebook, solely so I could access the terminal/shell and through that, Vim. I’m not a fan of Vim but it lets me edit my LaTeX files offline. Which is what I need for editing my thesis on the go. However, when online, I use the excellent Neutron Drive application that combines nicely with my Google Drive account to allow me to edit my files. So therefore, the main reasons I bought the Chromebook is covered. Day to day use is otherwise good - the syncing of the Chrome browser is great and allows all the extensions I use on the desktop to sync across to the Chromebook and vice versa. This means my workflow is unaffected by changes in platform less. Whilst I initially disagreed with the use of Google Docs, I’ve become more of a fan. For basic documents, it’s not to bad. For anything academic or with some more advanced features, it falls down. Its ability to convert Word documents is lacking - it means I can’t edit work documents as the work template is completely mangled by the conversion process. But it works well for allowing me to write up notes, letters and magazine articles where I don’t need to insert references and cross linking. Music wise, Google Music allows you to upload 20,000 songs and then stream them for free. This works fantastically well with the Chromebook where you have a decent connection. However, if you have the files stored on a USB or SD card, you can easily access them and play them locally which is a great boon for me as I love having my music nearby (to be fair, I do have a 120GB iPod with me most of the time that I would use as well). Installation of new fonts is not supported. I can hack the Chromebook to allow me to install fonts of my choice but means that I can’t disable developer mode without a downloading and installing a recovery image from Google. The other niggle is because I have enabled developer mode, the Chromebook displays a notification I have on startup - this remains on screen for 30 seconds or until you press Ctrl+D. Overall I’ve been happy with the purchase - not only has it allowed me to stay mobile and get work done, more so than my iPad and keyboard combo, it’s helped focus me. On the move with no wifi, you can only open files that the Chromebook supports (and that’s if you’ve already downloaded them or they’re on a USB drive) and write Google Docs in the Writer. This means that the ability to turn off the wifi and I’m straight away plunged into a pure writing environment. Even better if I’m in Vim writing LaTeX, as it’s a full screen terminal with nothing else to distract. As a second computer, laptop or a cheap computer, the Chromebook performs and provides the ability to do what most people need of a portable machine. Teamed up with Chrome Remote Desktop, it makes for a fantastic, lightweight, terminal for a remote server/desktop. Which I’ve got setup for those occasions that I need to access a server remotely and run something that the Chromebook can’t do (LaTeX compiling on my home Mac for example).